Join the samurai known as the Ronins in this ancient Japanese adventure. Click here to play! Let the Ronins help you spin in big wins and a golden fortune! The ancient Japanese Koku is going to help you the most in your samurai quest. This golden coin only appears on reel 3, but it will substitute for all other symbols excluding scatters. It will also all prizes when it appears in a winning combination. 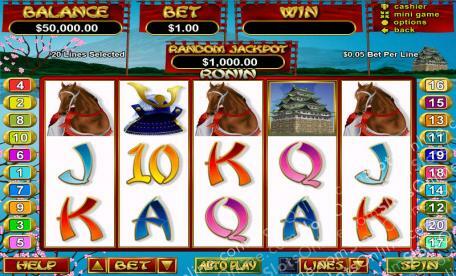 There are plenty of other symbols that will help you amass your fortune in this exciting game. Spin tow or more pagodas and you can win up to 2000 times your original line bet. Horses will get you up to 1000 times your bet, and samurai armor and flags will get pay out up to 500 times your original line bet. Of course, you wouldn't be able to survive this adventure without the help of the Ronin. This samurai defender acts as a scatter. Two or more of him anywhere on the board will get you up to 500 times your total bet. He also plays a part when it comes to triggering the three features that could see you winning free games and re-spins. Travel back in time to join the ancient Japanese Ronins for your chance to win. The Ronin acts as a scatter. Two or more of him anywhere on the board will mutliply your total bet by up to 500 times. If you spin two or more with a Koku on reel 3, you'll trigger one of three features that could award you with free spins or respins. The Koku acts as a substitute symbol. It only appearson reel 3 but will substitute for all other symbols except scatters. It will also double prizes when it appears in winning combinations.